This year’s London Nocturne (June 9) will be screened by Channel 4 – the first race to be shown by the broadcaster since they dropped their Tour de France highlights coverage in 2001. Alex Dowsett time-trialled his way to the win in last year’s race; the best bits of which were later shown on Sky Sports. However, the highlights of the 2012 Nocturne will be shown on terrestrial TV for the first time in the event’s history. Cycling Weekly can reveal that highlights of this year’s action are currently scheduled to be shown on the Sunday June 17 – the weekend after the race. The programme will also be available on the broadcaster’s on-demand service, 4oD. 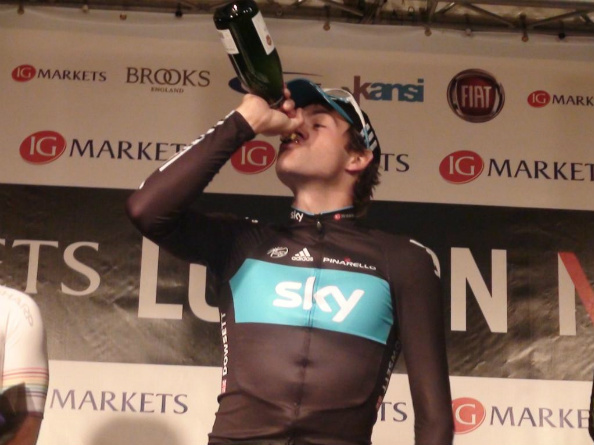 Team Sky’s Alex Dowsett enjoys the rewards after winning the 2011 Nocturne. Race organiser Face Partnership has also announced the reinstation of the Women’s Criterium. The race, to be sponsors by event co-founders Rapha, had been previously omitted from the race programme. Thankfully, following an “overwhelming response from the elite cycling community”, the race will take place. With an extended schedule, the women will begin at 8.45pm, which will see it take place under the lights for the first time.